Catching up? Order your pattern and read the previous sewalong posts. Before cutting out your fabric, it's always a good idea to stick it in the washing machine on the setting you plan to wash the finished garment on. Fabric can shrink in the wash so it's much better to get this out of the way before cutting so you don't end up with a teeny tiny jumpsuit after the first wash! Once the fabric is dry, iron out any creases, testing the iron setting on a corner of the fabric first so you don't scorch it accidentally. Fold the fabric in half lengthways, with the right side (the nicer side) on the inside of the fold, bringing together the selvedges, which are the finished edges of the fabric. Check the fold is hanging straight - if it looks twisted, hold the fabric up by the fold and adjust until it's straight. Keeping the fabric folded like this, lay it out on the largest table you have, preferably with a cutting mat underneath so you don't scratch the table! Folding the fabric in half allows us to cut two symmetrical pieces at once, or one symmetrical double-sized piece where a piece is cut on the fold. Cut roughly around the pattern pieces in your size, leaving 2cm (1in) or so around the lines. If you're making the trouser version, you'll just need five pieces - front trousers, back trousers, pocket facing, pocket bag and waistband. If you're making the jumpsuit, you'll need all the pattern pieces (ten in total). 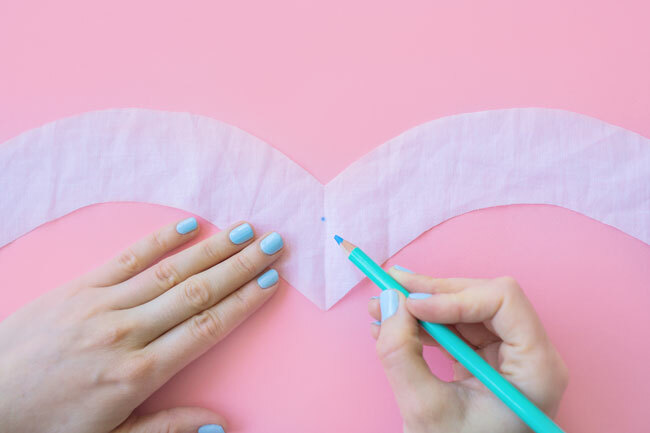 The pattern instructions include diagrams showing you what we think is the most economical way of laying out your pattern pieces, without wasting fabric. 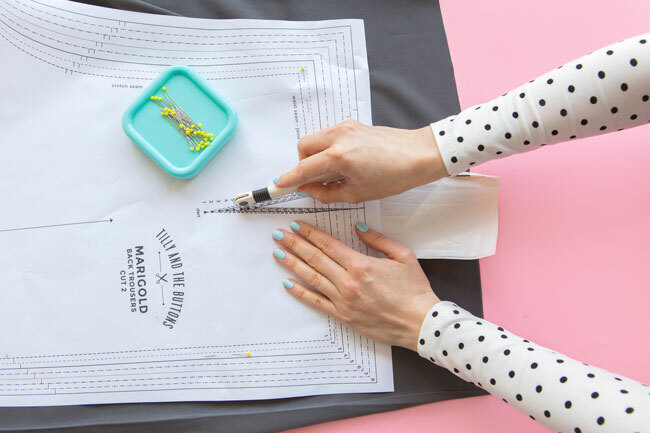 Find the diagram that corresponds to the version you're making (trousers or jumpsuit), the width of your fabric (around 150cm/60in or around 115cm/45in) and your size (1-4 or 5-8). Lay the pattern pieces out on the fabric, in the layout suggested by the diagram (or go freestyle if you prefer!). Most pattern pieces should be laid out right sides up. However, if there's a shaded pattern piece on your diagram, this means you should place the piece face down to save fabric - unless your fabric has a directional print, in which case lay it right sides up and shuffle it down a bit, so the print points in the same direction on all pieces. You'll notice that some pieces have a double hooked arrow pointing to one side which says "Place on fold". Line up these pattern lines with the fold of the fabric - this lets us cut one double-sized symmetrical piece. For the other pieces, line up the "grainline arrows" so they're exactly parallel to the selvedges or fold - this will ensure the fabric hangs nicely without twisting. Read more about lining up the grainline. 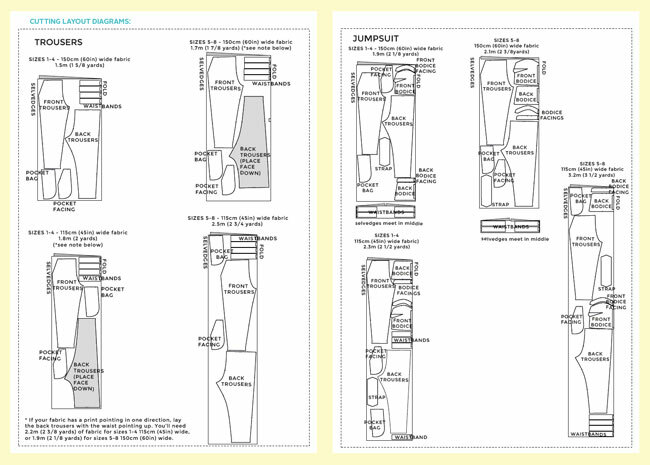 If you're making the jumpsuit and your fabric is around 150cm (60in) wide, you can save fabric by folding a piece of the fabric with the selvedges meeting in the centre, rather than at one side - take a look at the cutting layout diagrams to see exactly what I mean. 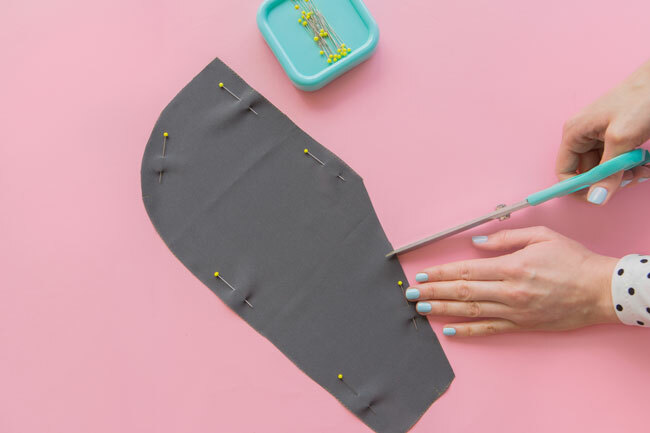 Once the pieces are in place, hold them on the fabric, either by pinning just inside the pattern lines for your size, or holding them down with pattern weights. If you're a regular reader of my blog, you may already know that I like to trace patterns onto fabric using dressmaker's carbon and a tracing wheel, rather than cutting through the pattern lines (which means you can't use a bigger size later) or tracing the pattern off first (boring). 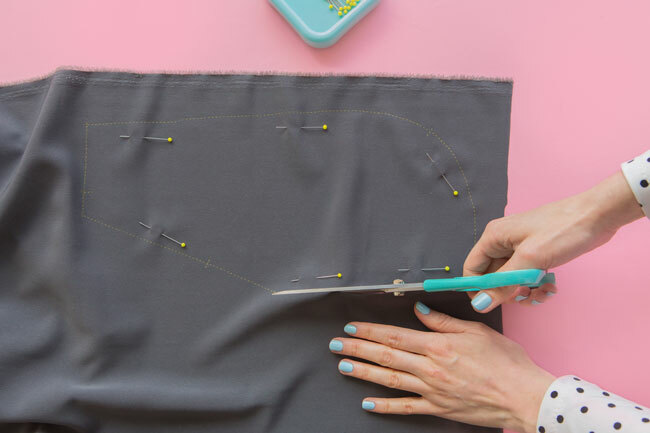 If you want to try this out, you'll need a blunt type of tracing wheel, rather than the sharp ones which can pierce holes in your fabric (they're better for pattern cutting). You can find these and dressmaker's carbon cheaply at many haberdasheries (see right) and on Amazon. What you do is slip the carbon, coloured side down, just under the line you want to trace off, between your pattern and fabric. 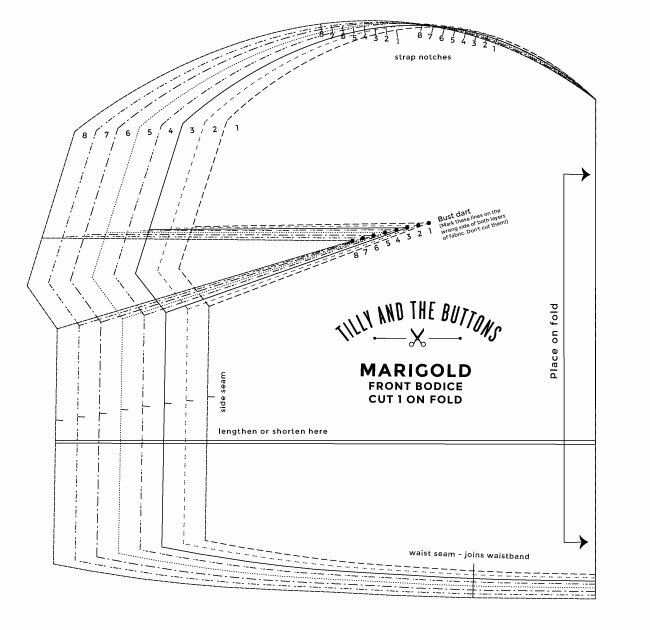 Roll the tracing wheel over the line and it'll transfer the marking directly onto the fabric. Choose a carbon colour that will show up on your fabric - if one doesn't show up, try another, and do press quite hard. Trace off all the pattern outlines in your size. You can also trace off darts and pleat lines this way. Remember to trace darts and pleats on the wrong side of both layers of fabric - you can slip another sheet or carbon paper under the bottom layer of fabric, carbon side up, to trace the two layers at once. Mark the notches this way too (the short lines at right angles to the seams) - you can just mark them on one layer of fabric. Remove the pattern pieces, then pin the two layers of fabric together so they don't slip around. Carefully cut directly through the pattern piece outlines, using either fabric scissors or a rotary cutter. Don't cut through the dart or pleat lines though! We need these markings for later. Cut short snips where your notches are marked - around 5mm (1/4in) long - these will help us pin the pieces together accurately later. I like to use iron-on woven interfacing for most projects. It's important to pick something that is a similar weight to your fabric, so it doesn't become too sturdy or too floppy. Cut interfacing to the shape of the front bodice facing, back bodice facing and one of the strap pieces (yes, just one). There's a "pivot point" marked on the front bodice facing, which will help you sew the sweetheart neckline accurately. Mark this on the non-glue (non-shiny) side of the interfacing using a chalk pencil or washable pen. Lay the neckline facing interfacing pieces over their corresponding fabric pieces, with the glue (shiny) side against the wrong side of the fabric (the side you want to go on the inside of the jumpsuit). 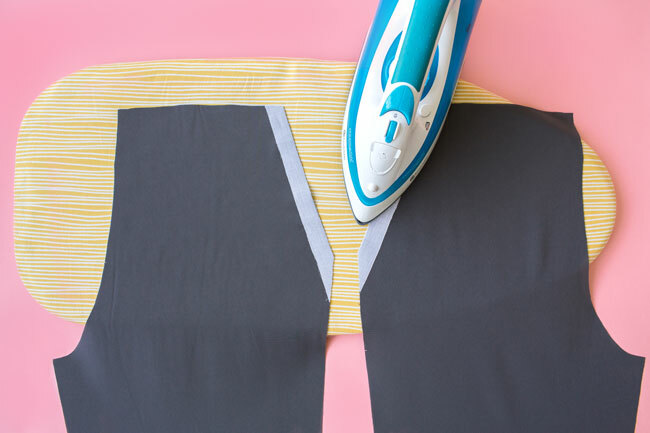 Hold a hot, dry iron on top to melt the glue and fuse them together. 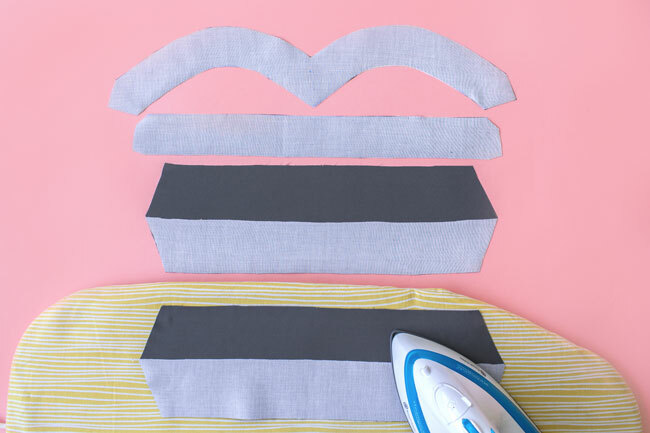 Don't be tempted to move the iron back and forth or it could squidge up the gluey interfacing into a nasty, sticky mess! Just raise and lower the iron onto each section and hold it in place for a few seconds at a time. To protect the interfacing from too much heat or moisture, you can place a pressing cloth (a piece of muslin or a tea towel will work) between the surface of the iron and the interfacing if you like, or just make sure there's no steam and the iron isn't too hot. For the straps, cut the interfacing piece in half lengthways, and apply one half to each strap. We'll be folding the straps in half and sewing the long edges together, so one layer of interfacing is enough. Okay, so now we're going to apply stabilising tape to the edges of the neckline and front trouser pocket opening so they don't end up gaping or droopy (noooooo). You can buy ready-made iron-on or sew-in stabilising tape, AKA "stay tape" - although it's not that easy to find in the UK at least. So what I've done is cut 20mm (3/4in) wide strips of lightweight interfacing. Cut them on the straight grain for the straight seams and on the bias for the curved neckline (TBH I cut all of mine on the straight grain and they were fine). The reason they're 20mm (3/4in) wide is that, on lightweight drapey fabric like what's suggested for Marigold, it's a good idea to ensure the stabilising tape crosses the seam line, to give them extra structure. 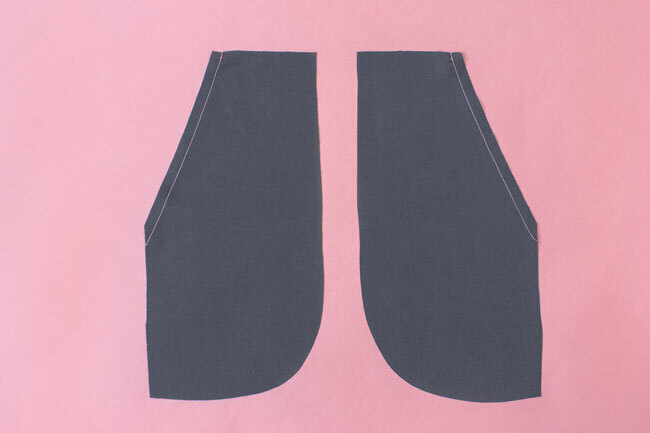 On the wrong side of the front trouser pieces, line up the stabilising tape with the raw edge of the diagonal pocket openings (marked on the pattern). (If your fabric looks the same on both wrong and right sides, make sure the pieces are symmetrical!) If the tape is iron-on, press it in place. If it's sew-in, stitch it along the centre of the strip. 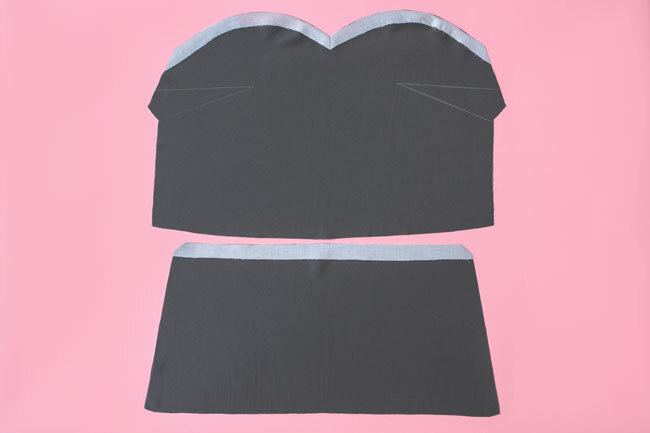 If you're making the jumpsuit, line up the interfacing strips with the neckline edges and press or stitch in place. The necklines are the sweetheart curves on the front bodice, or the shorter of the two long edges on the back bodice (they're also marked on the pattern). 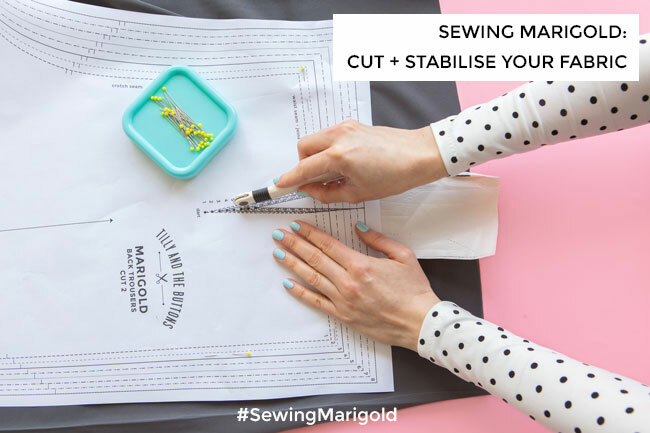 The other seams that need stabilising are the diagonal edges on the pocket facings, as bias-cut fabric can stretch out of shape. Applying stabilising tape here would make the seams too bulky as they're going to be sewn to the trouser pocket opening edges. So we're going to staystitch them instead. 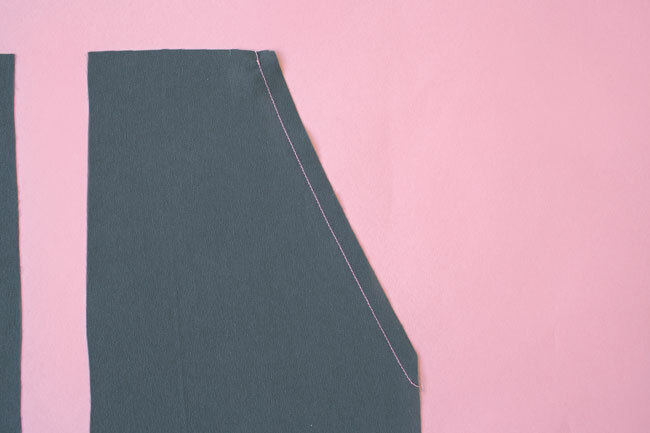 All you need to do is sew a single line of stitching on each pocket facing, 10mm (3/8in) from the diagonal edge. There's no need to back tack. And that's it! Pieces all cut out and stabilised. In the next step, we're going to start sewing - the trouser darts, pleats and pockets. For now, make yourself a rewarding cup of tea (wine).